Prof Jerry Coyne, is an evolutionary biologist, known for his work on speciation and his commentary on intelligent design. His work prominently focuses on understanding the origin of species: the evolutionary process that produces discrete groups in nature. He is the author of the popular science books: Why Evolution Is True and Faith Vs. Fact: Why Science and Religion are Incompatible, is visiting India from 16th December 2017 to 4th Janurary 2018 to give a series of lectures covering a range of topics - Science, Evolution, Rationality, Free-will etc. 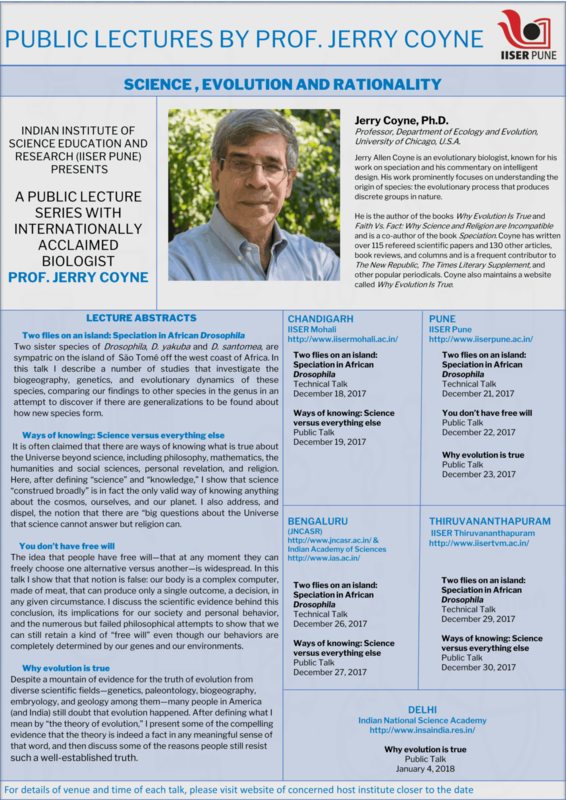 Prof Coyne’s talks are organized in IISER Mohali, IISER Pune, JNCASR Bangalore, Indian Academy of Sciences, Bangalore, IISER Thiruvananthapuram and INSA, Delhi.